Charles Thomson and Congress President John Hancock were the only two men actually to sign the Declaration of Independence on July 4, 1776, and Thomson played a key role in the new government. Ultimately, the federal government embodied in the Constitution was necessary to forge the states into a nation. In the meantime, though, the Confederation Congress encouraged cooperation any way it could, including through the interchange of state laws. 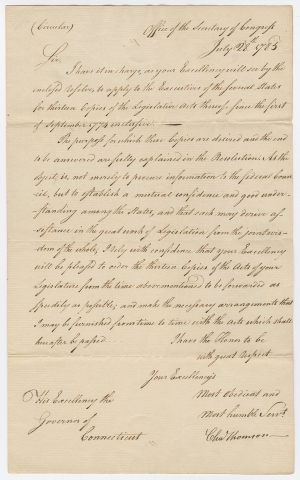 Here, Thomson sends a copy of the resolution to Governor Matthew Griswold of Connecticut and requests copies of all of Connecticut’s state legislation passed since September 1, 1774. CHARLES THOMSON. Letter Signed, to Governor Matthew Griswold of Connecticut, [Philadelphia], July 28, 1785. 1 p.
I have it in charge, as your Excellency will see by the enclosed resolve, to apply to the Executives of the several States for thirteen Copies of the Legislative Acts thereof, since the first of September 1774 inclusive. The purpose for which these Copies are desired and the end to be answered are fully explained in the Resolution. 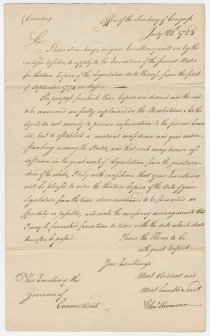 As the object is, not merely to procure information to the federal Council, but to establish a mutual confidence and good understanding among the States, and that each may derive assistance in the great work of Legislation from the joint wisdom of the whole, I rely with confidence that your Excellency will be pleased to order the thirteen Copies of the Acts of your Legislature from the time abovementioned to be forwarded as speedily as possible; and make the necessary arrangements that I may be furnished from time to time with the Acts which shall hereafter be passed. In 1777, the Second Continental Congress adopted the Articles of Confederation after sixteen months of debate. Ratified by all of the states by March 1781, the Confederation was inherently flawed in several ways. There was no separation of powers. Each state, no matter its size, had one vote in Congress. Any act required the approval of nine states, rather than a simple majority. There was no chief executive. Perhaps most importantly, Congress could not levy taxes, instead having to resort to requesting requisitions from the states and loans from abroad. When the Annapolis Convention of 1786 convened to work toward new commercial agreements between states, nationalists Alexander Hamilton and James Madison called for a broader convention, to be held in Philadelphia in 1787 to discuss constitutional amendments. Congress concurred, calling on the states to send delegates, who quickly agreed on the need to discard the Articles of Confederation and to draft an entirely new frame of government. Charles Thomson (1729-1824) was born in Ireland to Scots-Irish parents. After his mother’s death, his father took his sons to the British colonies in America. His father died at sea, and Thomson and his brothers were separated. A blacksmith in Delaware cared for him, and he received an education in Pennsylvania. In 1750, he became a Latin tutor in Philadelphia. Thomson became a leader of Philadelphia’s Sons of Liberty. Most importantly, he served as secretary to the Continental Congress through its entire history, from 1774 to 1789. Thomson and Congress President John Hancock were the only two men actually to sign the Declaration of Independence on July 4, 1776. In 1782, Thomson took the work of three previous committees to create a final design for the Great Seal of the United States. Thomson remained the keeper of the seal until the creation of the new Federal government, when the role passed to the Secretary of State. In April 1789, Thomson notified George Washington of his election as the first president of the United States. Thomson resigned as secretary of Congress in July 1789, and political disagreements kept him from a position in the new federal government. He spent the next two decades preparing the first English translation from the Greek Septuagint of the Old Testament and the first American translation of the New Testament. It was published in 1808. The recipient, Matthew Griswold (1714-1799), was born in Connecticut, opened a law practice in Lyme and later became the King’s Attorney for New London County. He served his state in various positions. He joined the Sons of Liberty to protest the 1765 Stamp Act, and supported the patriots in the American Revolution. He was elected Deputy Governor of Connecticut each year from 1769 to 1784, and also served as Chief Justice of the Superior Court. He was governor from 1784 to 1786, and in 1788 was president of Connecticut’s Ratifying Convention for the U.S. Constitution.